REI is opting to go outside instead of participating in Black Friday sales. 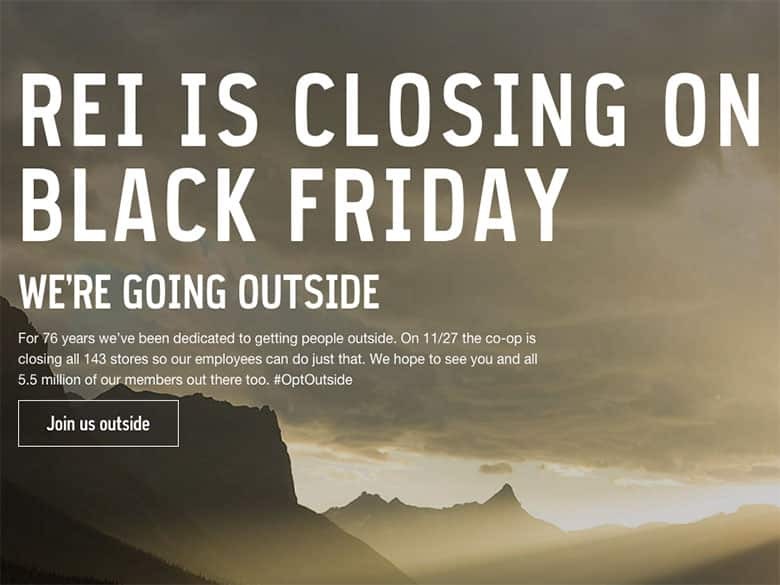 REI is closing its stores for Black Friday this year, encouraging their employees and members to spend the day outside instead with their #OptOutside campaign. Considering their ad scan last year was only one page (compared to Kohl's 60+ page novel), it's not really a big loss for them to skip out on Black Friday in exchange for all the media attention they're receiving from it. While we applaud the move of giving all of their employees a paid day off to spend time with their families and be outside, which lines up perfectly with what Thanksgiving and REI are about respectively, it's not going to be something you'll see other retailers copying. Plus, REI might still have their holiday sale before and/or after Black Friday instead. That makes for less pressure to come up with Black Friday-standard deals as well. They've allude to "great deals" this holiday season to their members in conjunction with their messaging about closing all stores on November 27. So instead of checking out REI's Black Friday store page, just keep your eyes fixed on their deals and coupons page over here and you'll catch all the deals they have planned for this year's holiday season. Any online orders placed during Thanksgiving/Black Friday will not ship until Saturday November 28, so keep that in mind as well.